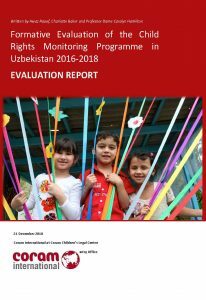 Coram International was contracted by UNICEF Uzbekistan to carry out an independent evaluation of UNICEF’s child rights monitoring (CRM) programme in Uzbekistan 2016-2018. The object of the evaluation includes six CRM projects implemented by UNICEF between 2016 and 2018, and UNICEF’s current approach to CRM which is reflected in its draft ‘Child Rights Monitoring and Evaluation Theory of Change 2017-2020. The evaluation also considers several CRM projects implemented between 2014 and 2016. This evaluation assesses the relevance, efficiency, effectiveness, sustainability and, to the extent possible, the likely impact of UNICEF’s CRM programme. The purpose of this evaluation is to produce recommendations, knowledge and insights for UNICEF, the Government of Uzbekistan, the National Human Rights Centre, Women’s Committee, the inter-agency working groups and monitoring groups in Ferghana, Jizzakh, Khorezm and the Republic of Karakalpakstan (RoK), non-governmental organisations (NGOs) and other key stakeholder groups, to inform the development of the Country Programme of Cooperation between the Government of Uzbekistan and UNICEF for the period 2016-2020. UNICEF has rated this evaluation ‘Highly Satisfactory’ and considers it to exceed UNICEF/UNEG standards for evaluation reports. The report generally observes good practices and can be used with confidence by decision-makers.